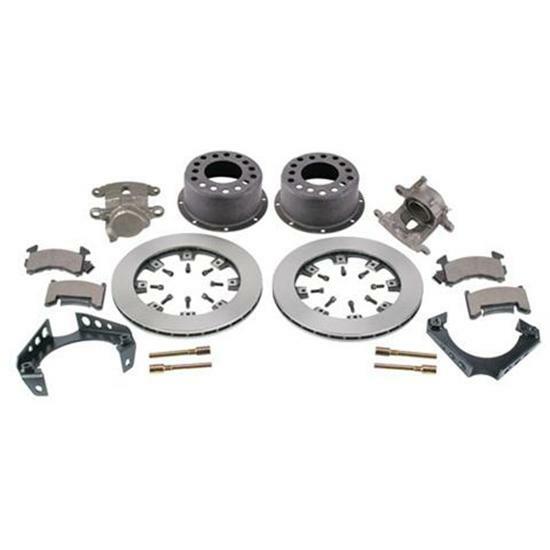 Multi: 5 on 5" | 4.75" | 4.50"
Includes rotors, rotor hats, caliper brackets, calipers, pads, and hardware. Replace those old drum brakes with modern rear disc brakes. Mounts .81" x 11-3/4" Pro-lite vented iron rotors and calipers to 3" tube rear end. Complete with rotors, hats, calipers (7/16"-20 inlets), brackets, brake pads, caliper brackets and slider bolts. Wilwood aluminum hats fits 5 lug hubs with 4-1/2", 4-3/4", or 5" bolt circle. This bracket features a 90 degree bend in the bracket at the slider bolt threaded area for additional caliper support. This part of the bracket may or may not interfere with the corner of the inner brake pad backing plate due to differences in brake pad manufacturers. When this occurs, it will be necessary to simply remove a minimal amount of backing plate material at each corner of the inner brake pad to allow for the necessary clearance between the bracket and brake pad when the caliper and pads are fully installed. 3.06" center hole, 6-3/8 I.D., 1/2" stud holes, 1.6 lbs.